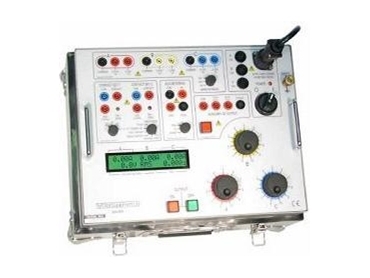 T&R test equipment is in the field of current injection system equipment. The current injection range includes secondary injection units with 50A output capability up to 6000A primary injection systems. All have true RMS metering, a flexible timing system, and an easy to understand user interface. The 50A-3PH three phase injection system is available from Macey's Electrical . The 50A-3PH is a three phase injection system providing commissioning and maintenance engineers with a flexible system for testing protective systems. It has an easy to understand panel layout and a simple user interface. The status of every function can be seen at a glance, and there are no complex menus to navigate. The back-lit display on the 50A-3PH current injection system is bright and clear with a wide viewing angle. The results of a test can be seen here as they appear on the display. The timing system is flexible without compromising ease of use, allowing trip times, reset times and reclose times to be measured to a high degree of accuracy. The unit has a range of outputs allowing injection of currents as low as a few mA and as high as 50A. Voltages up to 18V are available on the main outputs. Three true RMS metering ranges are provided, allowing the full scale of the meter and trip level to be set independently of the selected output. Industry standard safety connectors are used on all inputs and outputs for convenience and safety.